Ok I get it Wade you like red bikes... so stick with GG. AND trying to find it, but Jody at MXA isn't impressed. All the other jap bike mags are starry eyed. Oh, Jody at MXA... it's in the last mag with the 450 shootout. They call it a shootout inside a shootout or something like that. They didn't have the honda long enough to evaluate with the others, but long enough to make a honda/ktm comparison.... and in every way the ktm was way ahead. The only thing the honda does better than the ktm is be red. I have been able to ride the RX on and off for the last month so much rain and flooding is keeping the ride time down. This is the bike Honda should have came out with over a decade ago. The best improvement without question is the engine, it closely compares to the 16 and 17 450 XCF but still lacks the over rev and pull that makes the KTM engine great. The bike handles good but the suspension will beat you up unfortunately. Is the handling better than the KTM or about the same? From what I've read, the handling is pretty phenomenal which has always been my prerequisite for a motorcycle. The Honda version of what handling should be always "fit" with me until they started screwing with the CRF geometry. I haven't gotten to ride the new KTM AER forks, but racers sure like them. 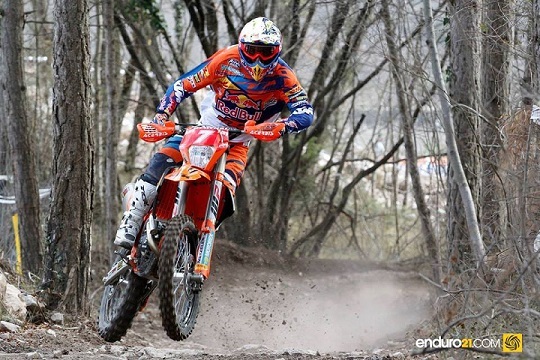 Personally i felt that the Honda handled well but i`m spoiled by the KTM frame and flex that it has, the Honda frame and suspension is not forgiving unless your at a constant race pace, the rear also has a tendency to want to kick up at certain times for some unknown reason. The suspension needs a total re-valve but even so the frame still feels rigid. For me the only time the overall package felt good was when it was rode aggressively. Combined with the weight and suspension the bike will beat you up and give your a work out. At KTMTalk another member Woodsrider2000 felt the same as i did, he is 65 yrs. old and an ex Honda guy, he liked the engine same as i did. For me the bike needs to lose weight, find some flex in the frame and suspension work. A normal day of riding for me is about 6-8 hrs, i can manage about 3-4 on the Honda. Given that it`s the best Japanese effort. I can buy a new KTM for a lot less than a Honda, i pay less than MSRP OTD, if you ever need help in buying one maybe i can help. You gentlemen need to read the February issue of MXA. There is a shootout-in-a-shootout because the Honda arrived late in the test and all the hype of the great do-it-all honda... well on every single point KTM is heads over the honda. As for it's hyped-up promise as a game-changer, that didn't materialize. The honda is a good bike with flaws. The KTM is a great bike with almost no flaws. Shifter's take on the Honda is it is in fact a better color red than the KTM. Not including the red number plate currently on Dungey's bike. I couldn't find it but I seem to remember something about the price point on the Honda... it's expensive. Plus you still need to de-jap it with a new clutch and chain for sure. Lose the twin mufflers to lose some weight. Oh you can add an electric start but it will cost $ and also add like 17 lbs with battery. Now we're getting back to 525 RFS weights again... jeesh. basically feed the mags extra cookies when they support their BNGs year after year. I'm also sick of how the media generally loves the jap manufactures and gushes on anything new from them while still minimizing KTM's advancement in the machines. Even the commentators on the televised AMA SX races, Jim Holley and... and... whatever his name is they were going off how great the new Honda is. I trust MXA mostly like I know you guys do too, but I do sense they almost hate to admit how great these bikes are. Like on the cover of the February shoot-out issue there is a blurb that says..
HONDA CRF450 DOES IT ALL. WTF is that all about? Reading it from a news stand one might think this is a great bike. If they stated instead HONDA CRF450 STILL COMING UP SHORT they would still get as many customers reaching down the grab the mag. Oh but the great Honda Corp wouldn't like that would they? So that's another reason I don;t like the jap manufactures... I mean ultimately it's choice of the bike mags but sadly they must walk in a little fear of their major advertising dollars slipping away when they get too honest. How can they not? But given the choice for a snow bike I'm certain a 450 ktm would still be better now that they are about the same weight as a big bore two stroke and I believe there is a place for FI... and that's not on the track or trails but at elevation floating over 12' of powder snow! Best me thinks to save the kx500 mill for an off-road go-cart... for my Stinker! If someone buy`s a Honda because of what is said on the front cover of a mag than they deserve what they get. Honda still has a lot of clout and influence on what is said MXA is about the only mag that has the guts to say whats up. I did a lot of work for Honda in the 80`s and early 90`s and they should be ashamed of their offering of the last two decades, i had influence on the original CRF450 and repeatedly told them that the bike was not ready but they brought it to market anyway. I had hope for the new bike and while it`s their best effort in decades it is no match for the 17 KTM 450SXF which i own have rode side by side against the new Honda, the KTM is head and shoulders above the rest and anyone who has rode both and says otherwise is not being truthful.